Yes we all know Kate loves her L.K. Bennett shoes and she wears them often. 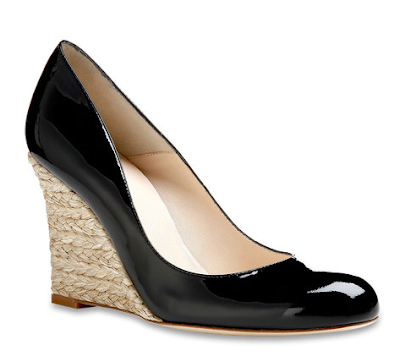 One of her more popular style of shoe is the patent leather espadrille wedge pump. She wore them before her wedding, after her wedding, and shopping as a married lady. Kate's version was marked as the "Greta" style of the L.K. Bennett brand in black, shown in a file photo below. However L.K. Bennett had subsequently discontinued that style and instead issued a new similar style by the name of "Maddox". The glaring differences are the style of roping on the wedge and the inch platform on the Greta style which is missing from the Maddox. Retails for ≈ £175, or ≈ $274 U.S. (plus international shipping). L.K. Bennett - Maddox wedge in black. Another similar L.K. 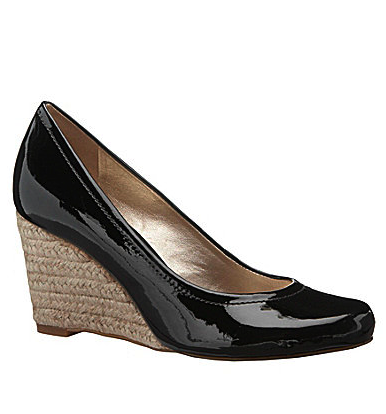 Bennett style is the brand's own "Zella" wedge. The Zella is more similar to the Maddox than the Greta, with the difference only in height. Retails for ≈ £165, on sale for £145, or ≈ $258 U.S. marked down to $227 (plus international shipping). L.K. 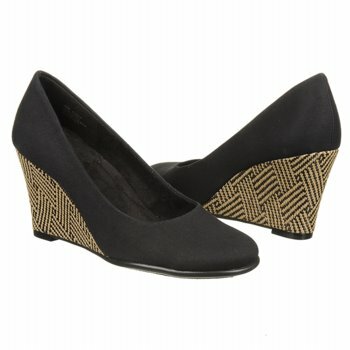 Bennett - "Zella" style wedge in black. The only supplier I have found for L.K. 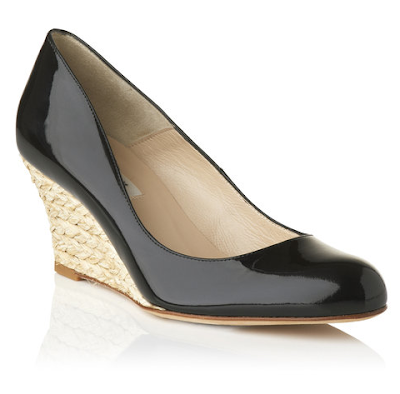 Bennett in the U.S. is Nordstrom, which carries both the Maddox (retails for ≈ $285) and Zella (retails for ≈ $265) wedges. black in color - or you can cheat with a darker navy shade because honestly who can tell. optional detail: patent or shiny leather or leather-like material similar to the Maddox/Zella style. a true pump style - i.e. closed-toe. optional detail: a wedge with a platform, similar to the Greta style. These are actually closer in style to the Maddox and Zella than the original Greta, but I actually think the slightly thicker sole of this one mimics the Greta's thicker platform. Aerosoles (via Famous Footwear and Aerosoles.com) has a patent leather pump + espadrille wedge combo shoe in a style called "Plum Tree". It comes in a variety of colors and heel options but the black patent leather color is very similar. Aerosoles - "Plum Tree" style in black patent leather. What's what by Aerosoles (via Famous Footwear) has a similar wedge pump style called "Coco Plum" that is currently on its its final stocks and therefore hard to comeby. It comes in two style of black canvas: one with a graphic raffia wedge (which is just about sold out in most sizes) and one with a leopard print wedge. This one is slightly further from the original style, but still very much captures the essence. The canvas I think is probably more summery and comfortable than the patent leather but of course not as sharp! What's What by Aerosoles - "Coco Plum" in black canvas. The Antonion Melani brand has a wedge style called "Tate" that is also a dead ringer for the newer L.K. Bennett versions. FYI, this style (and the Aerosoles Plum Tree above) are probably on the "higher end" of the cheapie versions. Retails ≈ originally for $89.99 but is as low as $59.99. 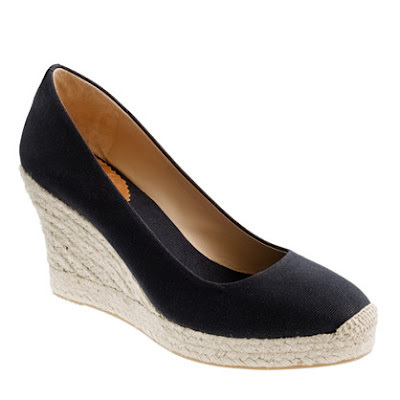 Antonio Melani - "Tate" espadrille wedge. The J. Crew Seville wedge espadrilles in black canvas are also a very close look a like with the rope platform and covered wedge. The only blip on this style is the every so slight rope cap toe, which isn't too obvious in its own right but is perhaps not what you are looking for if you seek a close representation. This style retails for ≈ $128, but the black canvas style is as low as $79.99. J. Crew - "Seville" wedge espadrilles in black. What do you think of the look a likes? Which would you pick, or would you just as soon splurge on the originals? I think I might just lean towards the Aerosoles version for many reasons. One is because I think it is the closest approximation to the original inspirations. Although the Antonio Melani version is cheaper, Aerosoles is a brand that is known for its comfort and that edges out its slightly higher price point. Thank you so much! This is awesome. Just ordered a pair of Aerosoles Plum Tree and can't wait to try them. Good for you Anon, I didn't know they were still selling the Plum Tree style. Hmm I'll have to go check it out now!